If I'm being honest, there are few things I actually enjoy about summer. I've learned that I will never adjust to east coast heat and humidity, and it isn't exactly enjoyable sitting in a cubicle all day, knowing that all the college students of the world are tanning and working in frozen yogurt shops. I'm bitter and unprepared for adulthood. Regardless, one thing I absolutely love about summer is the fresh produce. Everything is greener, everything is fresher, and it's all just plain yummy. I was spoiled growing up in California where the fruits and veggies are the highest quality (it's a fact, people), and I always loved getting strawberries. My mom doesn't care much for them, but my dad always loved them. Needless to say, with this heat and the stress of living away from my husband for a few weeks, we definitely needed to indulge in some dessert. So I needed to find something that wouldn't ruin our flawless bikini bodies (fiction, not fact). 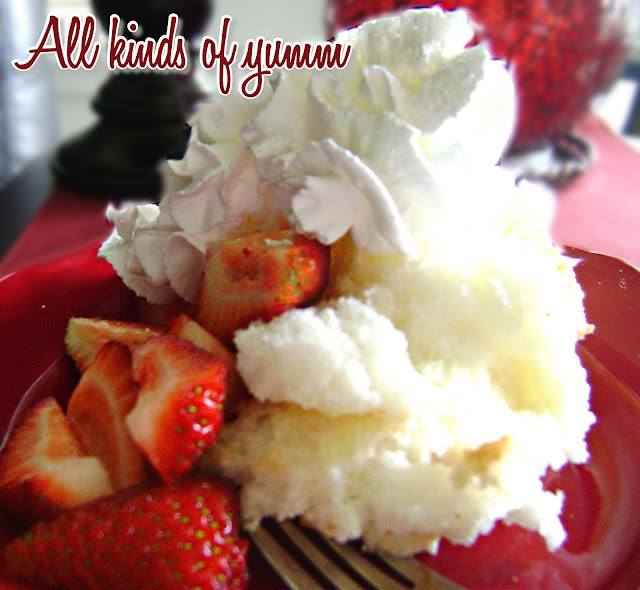 Angel food cake is made up of lots of egg whites, which cuts the calories tremendously. There's actually under 150 calories in a typical piece of angel food cake. Throw on some fresh strawberries and whipped cream (which is also low in calories), and you have yourself a fresh, low-calorie summer treat. Sift 1 cup flour and 1/2 cup sugar together 3 times. Place egg whites in a large mixing bowl. Beat on high speed until all egg whites are foamy. Add cream of tartar, salt, vanilla extract and almond extract. Beat egg whites until they're stiff, but not dry. This can take awhile, so be patient. You should definitely use a hand mixture for this. If you use a spoon, you will be doing this for a very long time. Add sugar, small amounts at a time, while continuing to beat on high speed. Sift flour/sugar mixture over egg white mixture about 1/4 cup at a time. Fold in gently but thoroughly using a spatula after each addition. Do not mix, and please be gentle! If you are rough with the egg white mixture, it will mess with the structure, which is what gives the cake it's fluffy "angel-ness." Is that a word? Pour batter into an ungreased angel food cake pan. Bake in a preheated 350°F oven for 40-45 minutes. Make sure your oven is preheated, otherwise it will mess with the cooking time. Also, make sure that you have plenty of room above the cake pan, because it will rise. I had to carve off the top of my cake because it rose so high that it was touching the top of the oven. Learn from me, lovelies! Cool cake in pan for 1 hour upside down, or until completely cold before removing the cake. Insert a dull knife along sides to free cake if cake is still attached after cooling. So there ya' go! This cake is airy and light and flawless.